This is mostly a documented case of me clearing out my refrigerator and pantry. When I made the decision to consciously not buy packaged items, it made me see how many packaged items I had in my home. Part of the natural process is to slowly use those items up and incorporate them into as many dishes as one possibly can. The only packaged item was the macaroni, but still, we must have had it for some time, even though it was stored in a glass jar. My weekly beans were longingly looking to be added to a hearty meal. Homemade vegan pesto was starting to go rancid in the refrigerator. I didn’t make enough this year to freeze into cubes. So sad ☹️. Slowly heat up the pan again and stir frequently, stop once everything is warmed up. 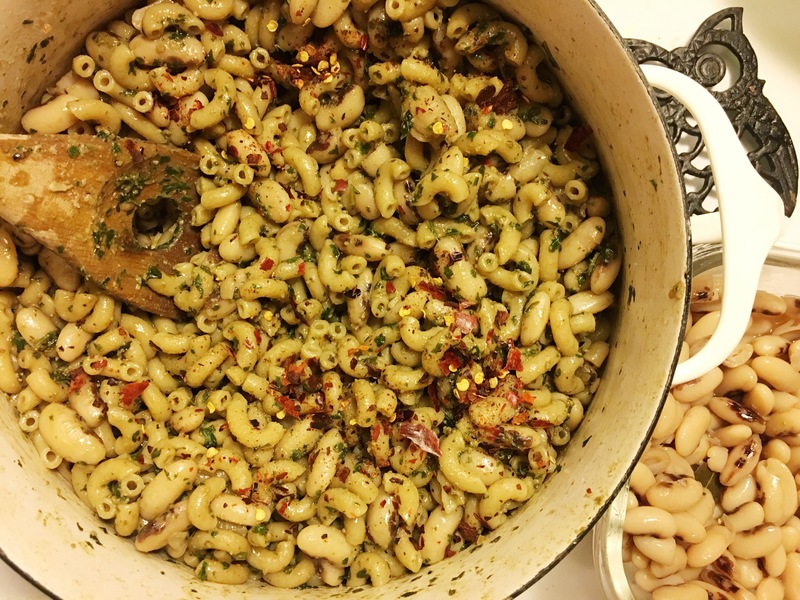 Pasta + beans is one of my favorite combinations, in nearly all forms. I think you’ll like it, too.